This artist's conception shows habitable-zone planets with similarities to Earth. From left: Kepler-22b, Kepler-69c, Kepler-452b, Kepler-62f and Kepler-186f. Last in line is Earth itself. Zeng and his colleagues analyzed data gathered by NASA's Kepler space telescope, which has discovered about 70 percent of the 3,800 known exoplanets to date, and the European Space Agency's Gaia spacecraft. The study's researchers used this information to develop a model explaining the relationship between an exoplanet's mass and its radius. "The beauty of the model is that it explains just how composition relates to the known facts about these planets," said Zeng, who presented the results in Boston Friday (Aug. 17) at the Goldschmidt Conference, a high-profile annual geochemistry meeting. But these alien water worlds are not just flooded versions of a pumped-up Earth. "This is water, but not as [it is] commonly found here on Earth," Zeng said. "Their surface temperature is expected to be in the 200 to 500 degree Celsius [390 to 930 degrees Fahrenheit] range. Their surface may be shrouded in a water-vapor-dominated atmosphere, with a liquid water layer underneath. Moving deeper, one would expect to find this water transforms into high-pressure ices before reaching the solid, rocky core." NASA's Transiting Exoplanet Survey Satellite (TESS), which launched in April, will likely find lots of these water worlds, Zeng added. And the agency's $8.9 billion James Webb Space Telescope, which is scheduled to lift off in 2021, may be able to characterize the atmospheres of some of these worlds, he said. 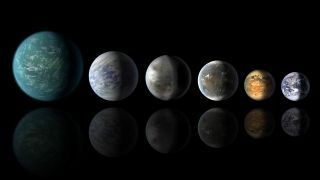 "It's amazing to think that the enigmatic, intermediate-size exoplanets could be water worlds with vast amounts of water," TESS Deputy Science Director Sara Seager, a planetary scientist at the Massachusetts Institute of Technology, said in the same statement. "Hopefully, atmosphere observations in the future — of thick steam atmospheres — can support or refute the new findings," added Seager, who was not involved in the study.